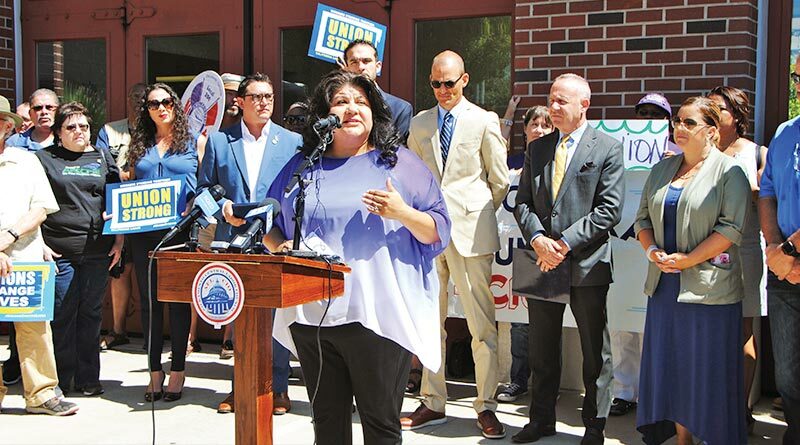 At an event after the Supreme Court decision, Sacramento CLC president Margarita Maldonado (center) was joined by union leaders, politicians and labor supporters who vowed to continue to organize for workers’ rights. Union members and allies joined together the last week of June to protest a U.S. Supreme Court decision that forces public sector unions across the country to allow “free riders” to benefit from contracts without paying any dues. Sasso continued, “We strongly condemn today’s decision, backed by rich and powerful billionaires and corporate elites. It is another attempt by the rich and powerful to take away working people’s freedom to stand together and negotiate a fair return on our work with good wages, decent benefits, safe working conditions and a chance to retire with dignity. Known as the “Janus decision,” the case means that unionized employees who choose not to join their union don’t have to pay any “fair share” fees either – yet still will be covered by collectively-bargained contracts. Legally, unions must negotiate on behalf of all workers, not just those that pay their fair share. All employees receive the wage increases, benefits and workplace rights that unions negotiate. That makes those who choose not to pay “free riders,” benefitting from the terms and protections of the contract while refusing to help unions cover the costs of negotiating them. In 1977, the Supreme Court ruled that states could require public sector union members to pay those fair share dues. Twenty-three states including California have laws that require it. The June decision undoes that protection, leaving unions faced with fighting to protect workers who refuse to help in that fight. The case was brought by Mark Janus, an AFSCME-covered child support specialist at the Illinois Department of Healthcare and Family Services. Janus claimed he didn’t want to pay fair share fees because he didn’t agree with his union’s political positions and it violated his First Amendment right of free speech. The court agreed. But Janus failed to recognize that unions are democratic institutions that elect leaders who set policy. Anyone who participates in the union has a voice in its policies. The real force behind the case was the corporate billionaire-backed National Right to Work Foundation. This conservative organization for years has sought to break unions. It routinely fights for so-called “right to work” laws and against living wages, retirement security, health benefits and more. In the face of the Janus decision, unions across the country are reaching out to members to talk and organize. While some members may choose not to pay fair share, union leaders are confident the majority will continue to support the work their organizations do to fight for fair wages and working conditions. Beyond contracts, this includes advocating and representing individual workers during grievances and fighting for better conditions for American families in communities across the county. The Sacramento region’s economy is anchored by our middle-class, public sector workforce. These union members are the people who teach our children, are first responders in an emergency, we keep our parks clean and safe, and we provide quality public services that we can all be proud of. These are the faces of our unions and they are the unsung heroes of our economy. “Working people know the benefit of choosing their union,” said Sasso. “We understand that we need strong unions to stand up to the rich and powerful who rig the economy against workers. They are afraid of the power in our numbers when we are organized. For over a century, unions have been the first, last, and best defense to corporate power and greed. When working people stand together, amazing victories are achieved. In Sacramento, unions have led the way to raise wages, ensure all workers have paid sick days, enact paid family leave, protect immigrants on the job, strengthen workplace safety, fund public education and much more.